Right. One of those fridge days. So what to make with this fruit combo? 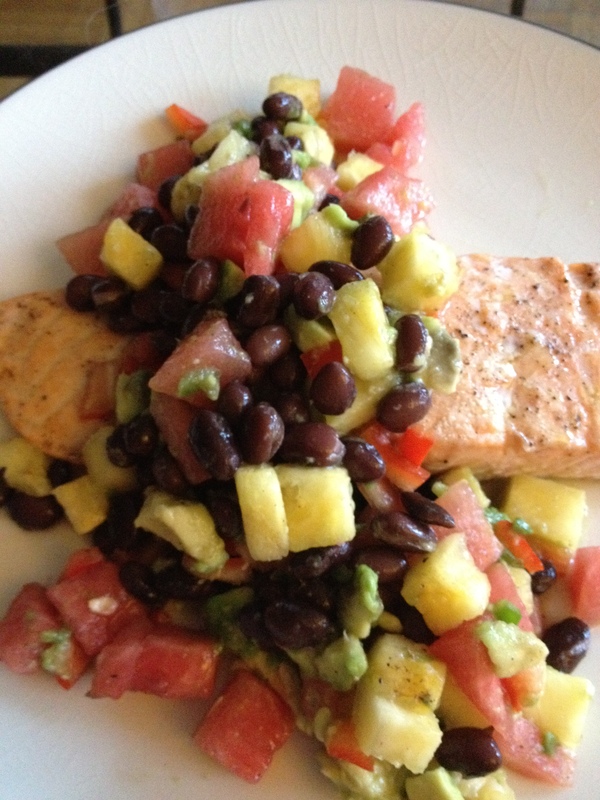 How about adding in some black beans, jalapeno and red pepper to make a filling, healthy salsa and using it to top a piece of baked salmon? Done and done! This would also work really well with tilapia if you’re not up for salmon. This was a simple and hearty meal that left me very satisfied. Definitely a keeper! 1. Preheat your oven to 375F. Line a baking sheet with foil. Place the salmon on the foil, coat with a drizzle of olive oil and season with salt & pepper. 2. Place the fish in the oven and bake for 13 – 15 minutes. 4. Remove the fish from the oven. Plate and top with the salsa. This is a fantastic light – but satisfying – salad that we tried for the first time last night. J added some lemon juice to it to brighten the flavours of the dish, which I think was a great touch. I’m generally not a huge fan of watercress, but I really liked it in this dish. Great summer salad, but would be good year ’round. 2. 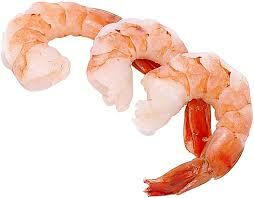 On half of a foil-lined sheet, arrange the shrimp in a single layer. On the other half, place the bacon pieces. Drizzle everything with olive oil; season the shrimp with salt & pepper. 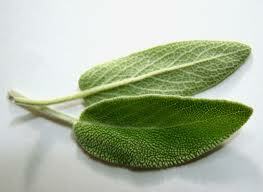 Sprinkle the sage leaves over the entire sheet. 3. On a second baking sheet, place the tomatoes. Drizzle with olive oil and season with salt & pepper. 4. Place both sheets in the oven. 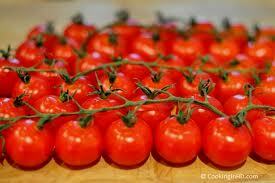 Cook the tomatoes until they burst, roughly 12 minutes. The shrimp and bacon will likely take a few minutes longer (roughly 15). 6. Add in the red wine vinegar, lemon juice and a little more olive oil. Toss to mix and serve! I’ve had a hankering for seafood lately and decided this would be a good weekend to make an old classic (mango over soba noodles) and try out a new variation on a sauce for tasty, briny mussels. Normally, I opt for either Italian or Thai flavours with mussels but I came across a can of chipotles and decided I’d go Latin instead. 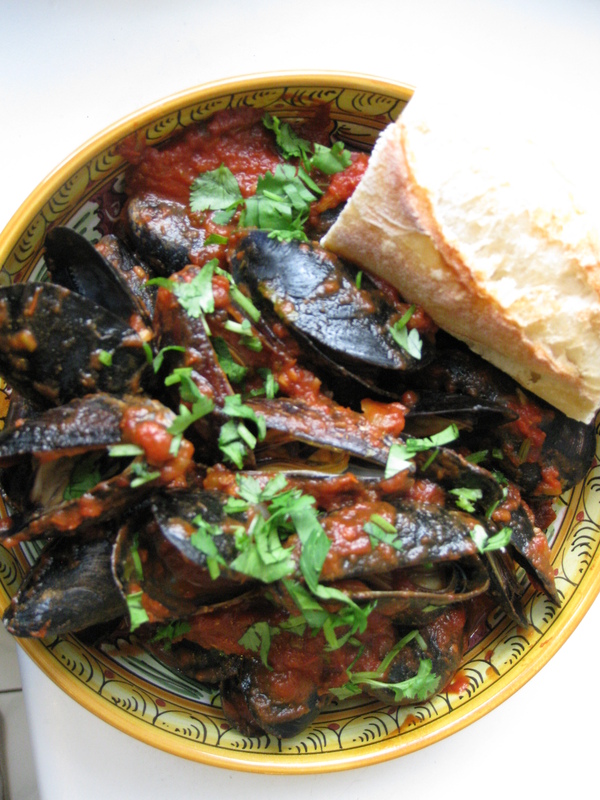 That’s the great thing about mussels: you can pretty much use anything that inspires you to make a delicious dinner! 1. In a large (and wide, if you have it) pot, heat the oil to medium and add the onion and garlic. Sauté 5 minutes. 2. Add in the tomatoes, chiptoles, salt, pepper, cumin, chili flakes, chili powder and oregano. Reduce heat, cover and simmer for 10 minutes, stirring occasionally. 3. Add in 3/4 of the cilantro. Taste and adjust as necessary. Simmer another 15 minutes. 4. Turn up the heat to medium and add in the mussels. Cover and let the mussels steam for 7-9 minutes. Shake the pot a couple of times, ensuring the lid stays on so no steam escapes. 5. 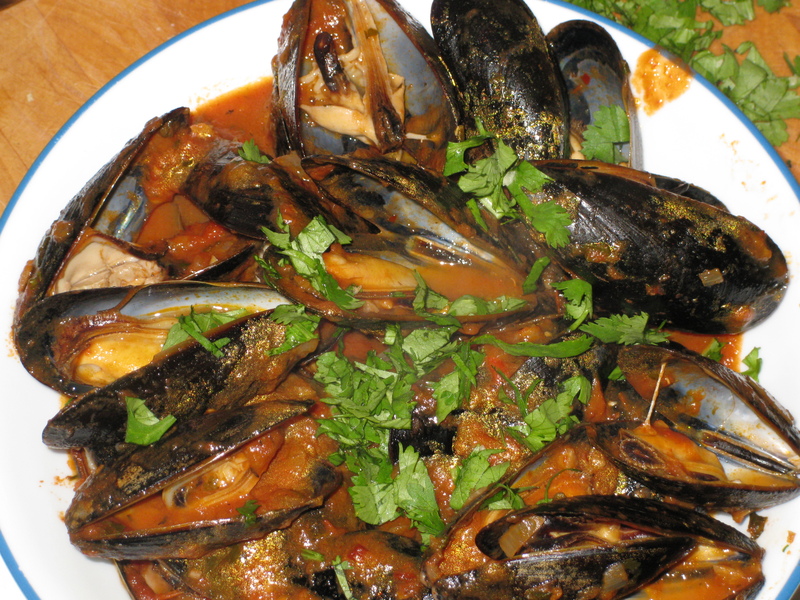 Plate the mussels and sauce, discarding any mussels that did not open. Top with remaining cilantro and serve with crusty bread. For my dad’s birthday this year, J and I decided to cook him up a birthday seafood feast. The first thing he requested was New England clam chowder. He threw out a few more ideas but I already had a pretty good idea that we’d make scallops as a main. He almost always orders scallops when we go out, I was pretty sure they would go over well. Okay then! To the cookbook shelf! 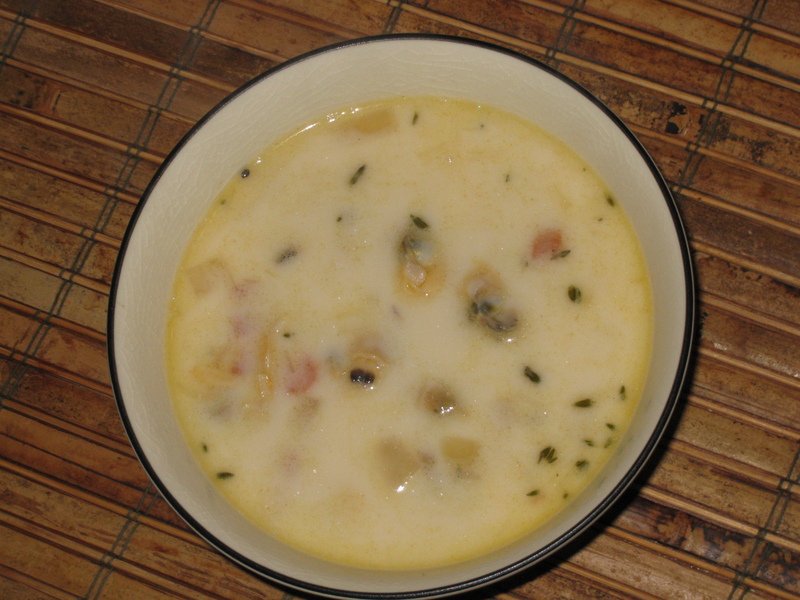 I ended up making a slightly modified version of Martha Stewart’s New England clam chowder. 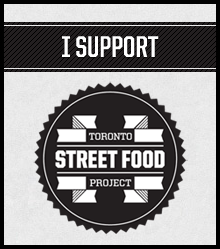 I went with beautiful pre-cooked clams from St. Lawrence Market and some clam juice instead of fresh clams. There was a fair bit of work to be done for dinner in a small kitchen and, quite frankly, I was able to add a ton of flavour- and clams – to the soup while being able to spend more time with my guests. I’ll try ’em one day, but not that day. The recipe below, however, uses fresh clams and has a few of my own adjustments. 1. Combine clams and water in a medium stockpot.Cover and bring to a boil. Cook until clams have opened, 5 to 6 minutes. Discard any that don’t open. 2. Using a slotted spoon, remove the clams. Strain the broth through a fine sieve lined with a coffee filter, which should result in about 4 cups of liquid. You can always add a little more if you need it. When the clams are cool enough to handle, remove the meat from their shells and coarsely chop. 3. Clean the stockpot you used and put it back on the heat at medium. Add the pancetta and cook 3-4 minutes. Some fat should render out and coat the bottom of the pot. (If there isn’t enough, add a little bit of butter.) Toss in the onions and sweat them til translucent, another 3-4 minutes. 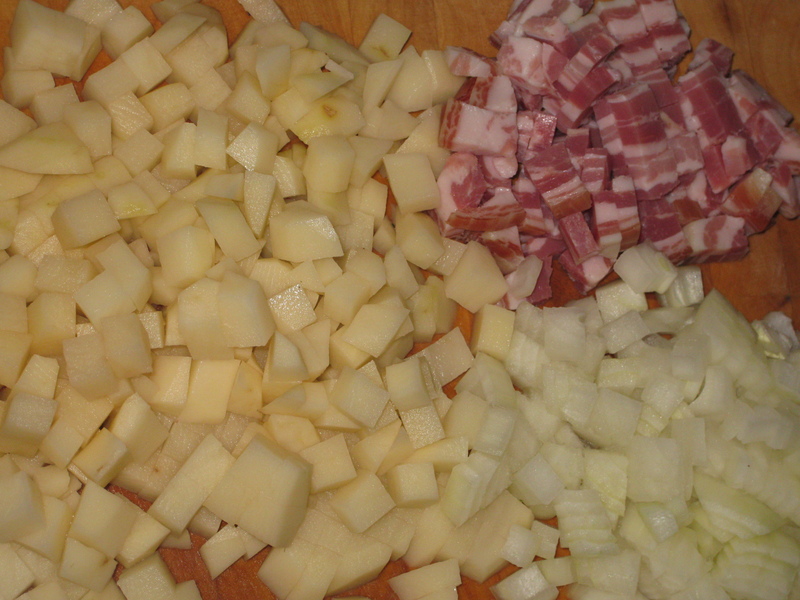 Potatoes & onions & pancetta! Oh my! 5. Add in the clams and the cream: DO NOT BOIL. The cream will separate. Cook for just another minute and season to taste. 6. Remove the thyme sprigs and bay leaves and serve immediately. As always, if you find a mussel that’s open before you cook it, discard it. If you find a closed one after it’s been cooked, discard it. 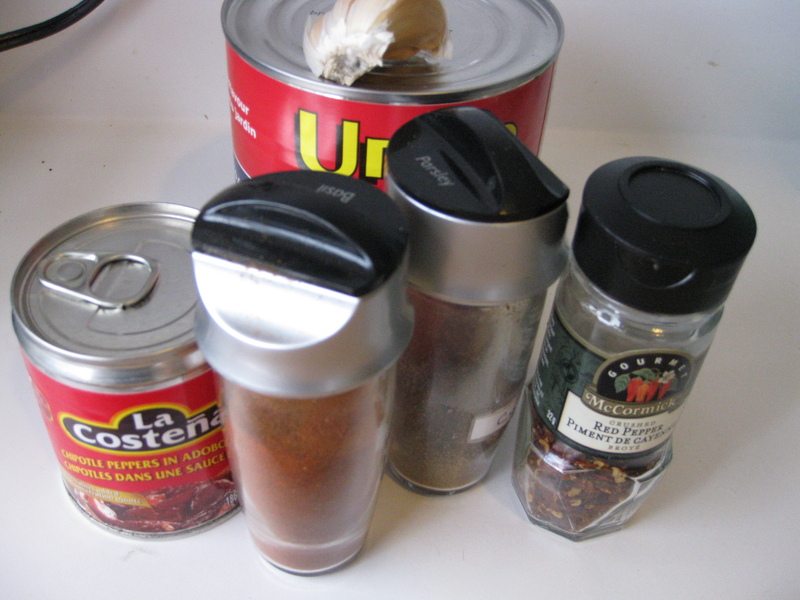 I used a decent amount of chili flakes in my recipe, but feel free to cut back if that’s not your thing. 1. Heat the oil to medium heat in a large pot with a tightly-fitting lid. Add the onion and garlic and sauté for 5 minutes, until the onions are soft. 2. Add in the tomatoes/sauce, parsley, thyme, chili flakes, salt and pepper. Stir together, reduce the heat and cover, simmering for 25 minutes. Stir occasionally. 3. Turn up the heat a bit and add the mussels. Cover the pot and let them cook for 7-9 minutes, shaking up the pot occasionally. 4. Serve with crusty bread to sop up the tasty liquid in the bowl – don’t let any of that go to waste! Belize 2012 – Day One: Ready for it All…Right After a Nap. 3:30am comes really, really early these days, especially when you’ve got to take on Pearson International Airport half an hour later. It helps to know that you’re headed on vacation to a beautiful country where friends, family and food await you. Last year’s day of departure was a total gong show; this year, a relatively painless experience. Most of the first flight was spent asleep or blankly staring at the seat in front of me. 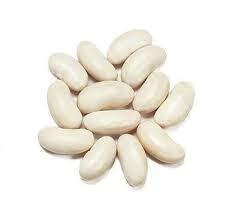 J and I were travelling with his aunt and upon arriving at the Miami airport we decided to go in search of breakfast. While I generally loathe the Miami airport and it’s ability to turn normal, reasonable people into shoving, rude, insane jerks, I must admit that they have a great selection of restaurants. We popped into a Tex-Mex place that had a surprisingly good huevos rancheros plate, served with warm flour tortillas. Beats a McD’s breakfast sandwich any day. Two hours later we were on our way to my adopted country, Belize. 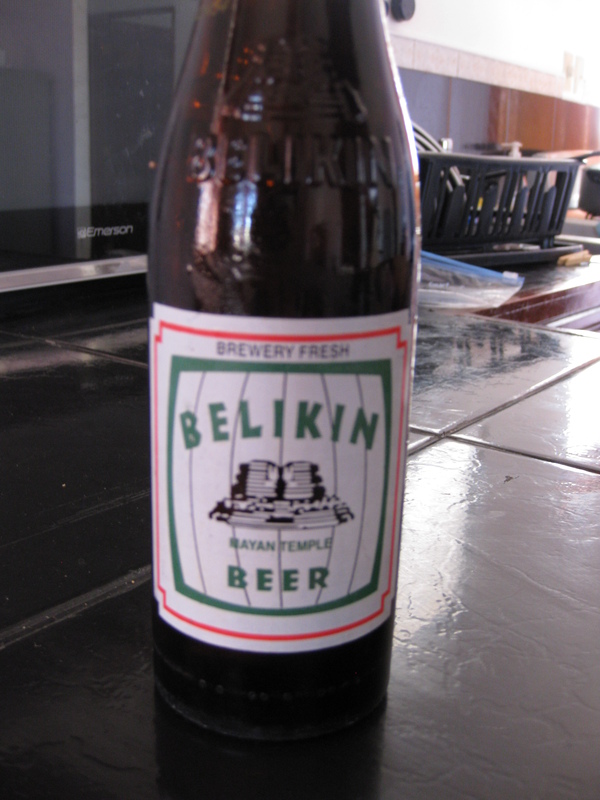 My in-laws were waiting for us at the airport and took us off to the house they had rented in Belize City. After a quick clothing change (there is no place for pants while on vacation, as far as I’m concerned), I sat down with my in-laws to catch up. “Are you ready for a beer?” my mother-in-law asked. Oh, how absurdly ready I was. This light, cold beer was exactly what I was craving after 11 hours of travelling and to accompany it, she had some chicken tamales for us to inhale. What a welcome! Beer and late-lunch taken care of, we went to visit some of J’s relatives, including his 97-year old great aunt who is an inspiration to anyone who meets her. We only stayed for a brief visit as it was pretty close to dinner and we didn’t want to disrupt anyone’s routine. Additionally, we were pretty exhausted and were very much ready for a nap. And since we were on vacation, that is EXACTLY what we did: dropped our bags on the floor in our hotel room and fell dead asleep for an hour. Naptime was proceeded by a nice, hot shower. Feeling much more human, J and I headed to the Baymen’s Tavern in our hotel (Belize City is not a place to explore at night by yourself). We ordered a couple of beers and J went for the fried shrimp platter while I opted for the grilled snapper – both with rice & beans and coleslaw. When in Belize, you’ve gotta get the rice & beans. It’s different everywhere you go but always delicious. 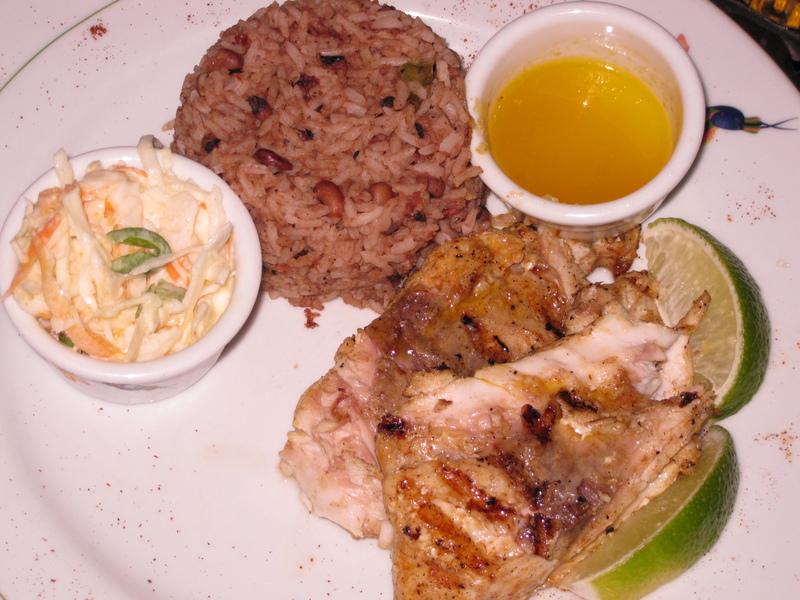 Grilled snapper, rice & beans, coleslaw: standard Belize fare. Seafood cravings temporarily fulfilled, we took a little tour around the hotel grounds. There’s something about dipping your feet in a pool that’s instantly relaxing. We returned to our room and sat on our balcony, breathing in the salty night air. Champagne was delivered to our room (part of the package we booked) but we were too wiped to enjoy it. No matter: we had plenty of other nights to enjoy it! Off to bed we went like responsible adults, knowing we had a long trip ahead of us into the mountains the next day. Next up: road-tripping with the in-laws. To all my fabulous readers: if you do nothing else, make friends with a fishmonger. They will always steer you right. There happens to be a fabulous fish store not too far from where I live (Avenue Seafood) and we’ve been getting great stuff from them for years. I walked in yesterday intending to buy some halibut fillets. The matriarch of the store shook her head – almost violently: “No, you don’t want the halibut. Look at these fillets: they’re not good enough for you. What else can I offer you? I have some great cod, or maybe some sea bass? How about some sea bass? I have some beautiful fish in the back!” I have learned from experience, just go with what she says. Since I was in the mood to try something new anyway, the sea bass was just fine with me. I surfed around the internet for a bit for inspiration and finally hit on some Indian-flavoured dishes that served as a jumping off point. Here’s what I ended up with. 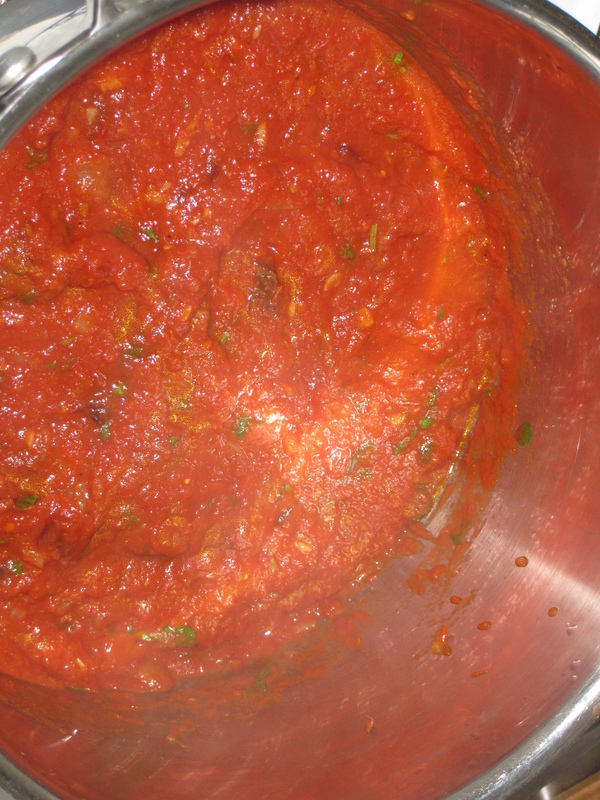 You’ll need about an hour total for this as the sauce needs to reduce and thicken. It’s an incredibly simple recipe, though, that requires almost no prep work at all. Just make sure to keep an eye on your sauce so it doesn’t bubble over. 1. Heat oil in a large sauce pan over medium heat. Add the onions, garlic and curry powder. Sauté until onions are translucent, approximately 4 minutes. 2. Add in the coconut milk and chicken stock. Stir to combine and bring to a boil. 3. Add in the salt, pepper, fish sauce and chili powder. 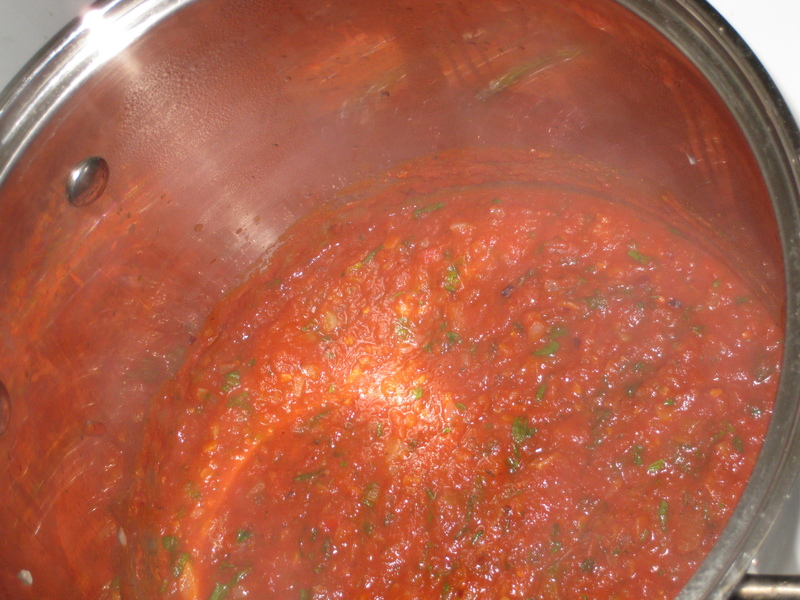 Lower heat and let the sauce simmer for 45-50 minutes, stirring occasionally. Taste every once in a while and adjust seasoning as necessary. 4. Add in the lemon juice at the end and stir. 5. Meanwhile, heat the broiler and place the oven rack roughly 2″ from the top. 6. Line a sheet with foil and place the fish on top. Season with salt and pepper and cook for 8 minutes, until the fish is opaque. 7. Plate the fish and generously spoon the sauce over the top. Best served with over rice to absorb the extra sauce.